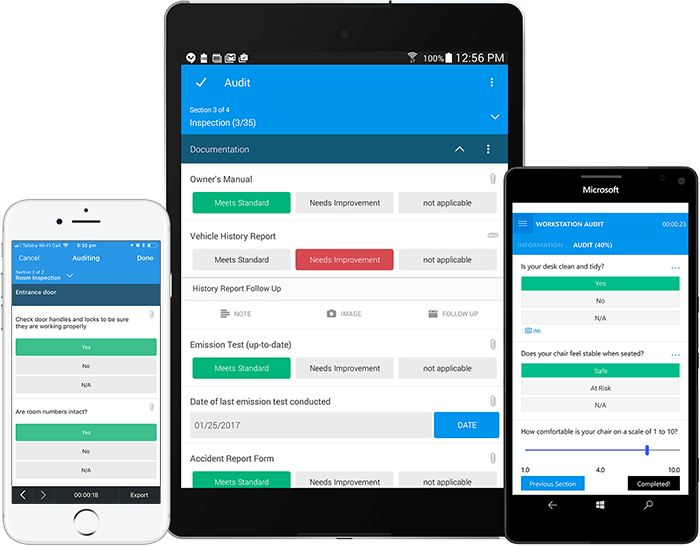 The world's most powerful inspection checklist app is now used 50,000 times a day in over 80 countries. Make your inspections quicker and easier to complete by showing and hiding form fields as needed. Add conditional logic to display or hide fields based on previous responses. Add a set of questions that can be duplicated on the fly as needed. Instantly access the most up-to-date forms from any location. Complete inspections regardless of whether you have internet access or not. 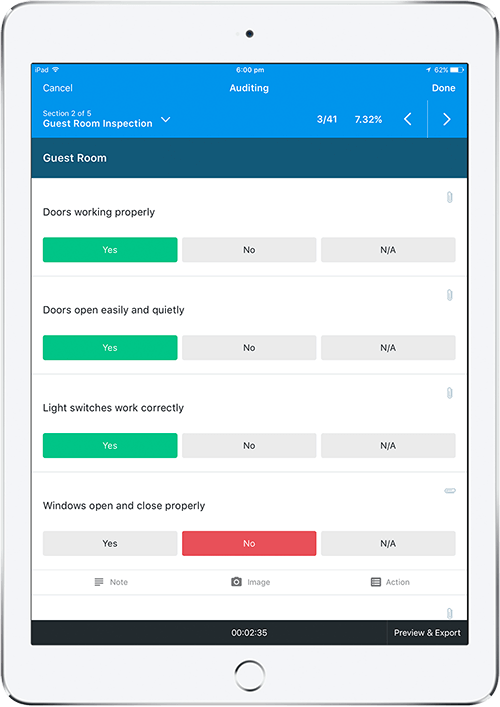 Access inspection forms on any iOS, Android, or Windows smartphone or tablet. Empower your team to conduct inspections and collect detailed information. Capture photos using your device’s camera, quickly snap and attach images to an inspection. GPS functionality makes it easy to identify exact locations during an inspection. Drop a pin to generate an address with coordinates. Write up additional notes inside a text box by typing or using your device's microphone to dictate notes faster. Record date and time information to accurately capture when inspections have been done. View relevant information while inspecting. Either reference plain text, an image, or click a link to an external website. Confirm information with sign offs and have accountability with digital signature capture. Create a corrective action on the spot for an issue that needs resolving. Assign actions to people, set the time, date and priority level for the next task. After an inspection is complete, an instant shareable report is generated. Share with the tap of a finger. Automatic syncing between mobile devices and desktop platform provide real-time analytics dashboards. Get visibility into your productivity, compliance, accuracy and more. Explore how to drive performance with actions, notifications and workflows. SafetyCulture iAuditor gives you the flexibility to power any inspection you require - onsite, underground, and across the globe. Inspect construction sites, restaurants inspections for food safety, conduct temperature checks, pre-flight checks, toolbox talks and more. It is the mobile forms inspection solution for all industries. "200 construction workers, 24/7 and our expectation is zero incidents. And with iAuditor, that enables us to achieve that."